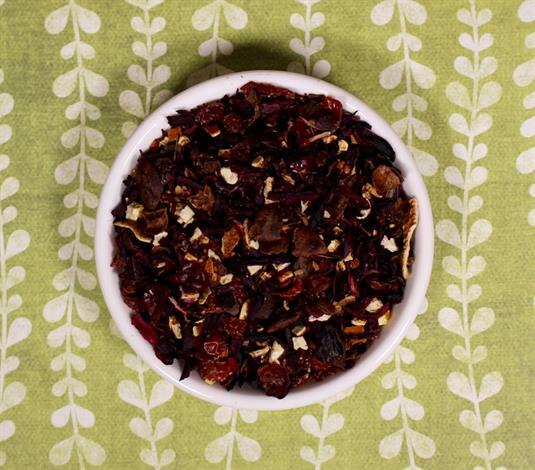 Home > Shop > Tea > Tea Herbal Hibiscus Berry 8 oz. Tea Herbal Hibiscus Berry 8 oz. The tartness of the hibiscus is balanced by the sweetness of blueberry, with rooibos giving body and notes of currant. Refreshing. Can be served hot or cold. Ingredients: Organic Hibiscus, Organic Rosehips, Organic Rooibos, Organic Orange Peel, Mango and Blueberry Flavoring. Brewing Suggestions: We recommend using spring or filtered water. Heat to 195F/90C. Use 2.5g / 1 tsp of tea for 12 oz of water. Steep 5-10 minutes.